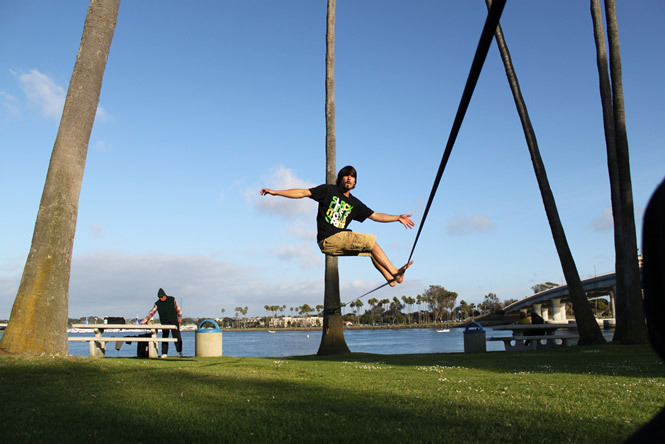 The Gibbon Surfline is the ultimate slackline for jumps and bounces – with the 30m length, it becomes really powerful when tighten up. The rigging is quick and easy, however its disadvantage is a higher price. Very similar to Jibline, the Surfline is also designed for tricklining enthusiasts. 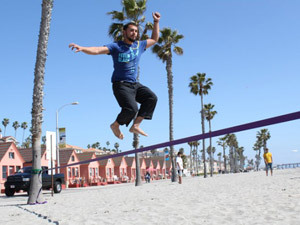 It offers the same flexible, trampoline-like webbing (just without rubber prints), but twice as much length – with 30 meters it is the Gibbon's longest 2inch slackline. 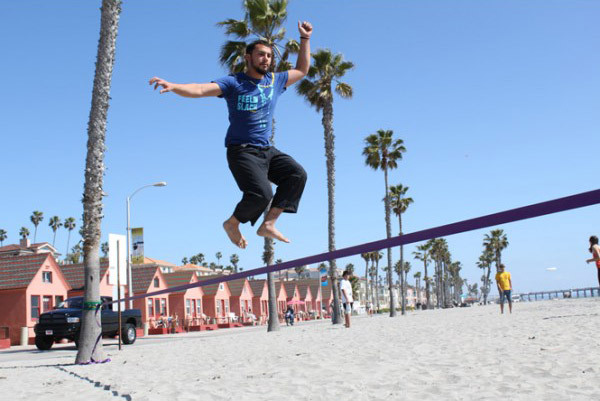 While it can be definitely used for walking longer distances, the main benefit from setting the Surferline that long is the additional power you'll get. 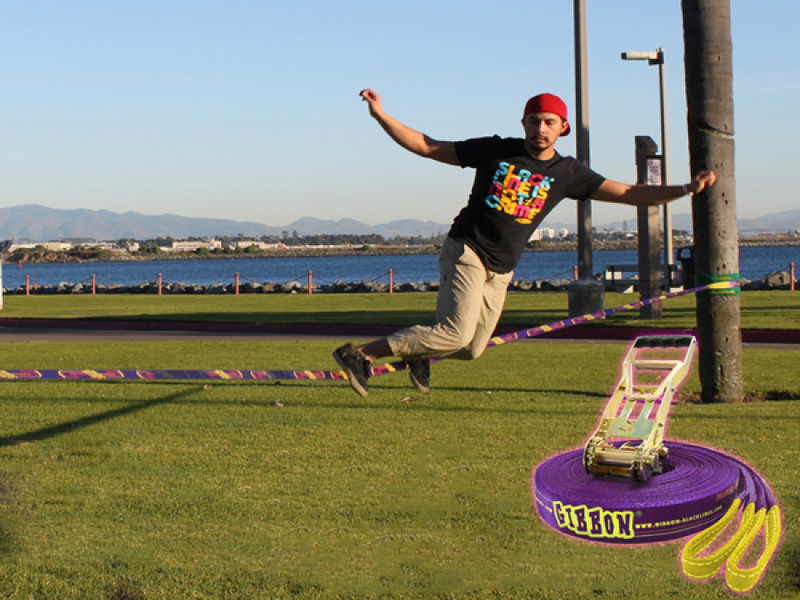 It features a larger, long lever ratchet so you can set it really tight – and then it will literally shoot you in the air every time you jump on it. As you can see in the video above, the bouncing and surfing possibilities of this line are amazing. 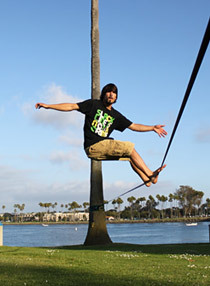 And all the tricks can be done really comfortably thanks to the wide 2inch webbing. It's also very suitable for waterlining. 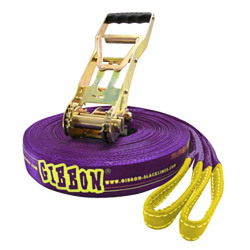 Featuring the popular Gibbon two-part rigging system, it's very easy to set up. However there are some important differences because of the larger lever, so please watch the video below before your first attempts. The point is – always make sure the ratchet handle is on the bottom side, if you do it the other way round, you will have a hard time with releasing the line afterwards. Conclusion: If you want to get the most out of jumping, surfing and bouncing action, then the Surfline is a perfect choice for you. Top line for surfing and very good for waterlining as well. But if you are just starting with tricks, or don't want to spend too much money, consider also the Jibline. It's cheaper and sufficient for most tricklining action. Surfline, Jibline or Classic – which one is better for tricks? How to do the surfing?